My grandfather was the first in my family to attend UW. He told me stories about how much he loved being a Husky and, as a kid, all I wanted was to be part of that experience. My family moved to Oregon when I was a teenager, but I still wore purple and gold in a sea of University of Oregon Ducks. My priorities were clear from the get-go. I was meant to be a Husky! UW provided amazing work experiences. As a student, I worked at the Nordstrom Tennis Center. My favorite memory is when Stone Gossard, guitarist for Pearl Jam, came in for a lesson. I got to volley with him and he gave me a ride to my car after work. As an upperclassman, it was the UW Career Center that connected me with the impactful internships that helped launch my professional life. We need to share our stories and advocate for UW wherever we go. Many of us owe a lot to what the university provided us during our formative years. As alumni, it is now our turn to give back. It is incumbent upon all of us to invest in the next generations. As Huskies, that is our call to action. 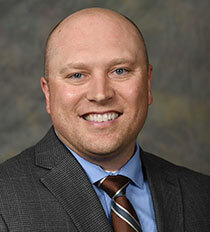 Nate Fulton is the agribusiness specialty practice director at PayneWest Insurance. He and his team provide risk management, loss-control and insurance services to agriculture clients in Washington, Oregon, Idaho and Montana. He previously worked at Wells Fargo Bank and Moss Adams LLP with an emphasis on agribusiness. His roots in agriculture run deep, as he spent his youth working for his grandparents’ apple growing and packing operation in Omak, Wash.